Now I'm nostalgic for the insanity all over again. DS/PSP forum wars were still the most brutal. Wii/PS3/360 is so pedestrian by comparison. I agree. And with the way things are going with the 3DS launching without any competition at all, we will probably never have a war like the DS/PSP days ever again. 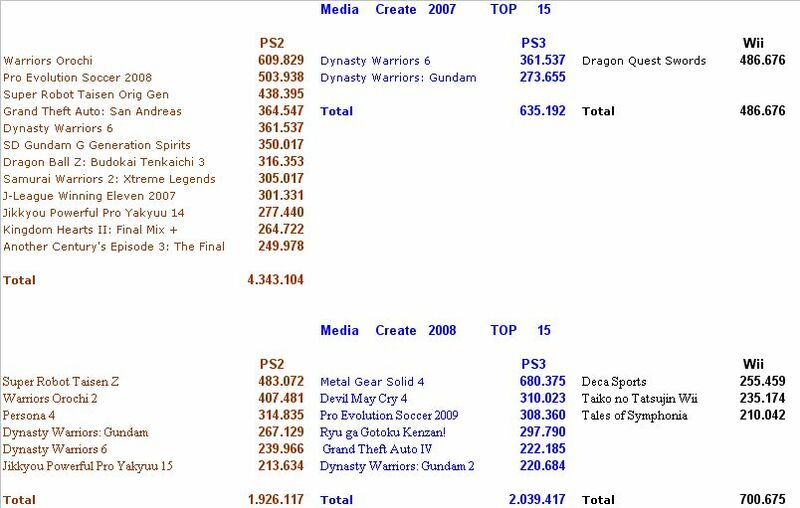 I remember how at some point the Top 15 selling softwares were nearly all DS games. No way. I'm disputing the notion that the handheld and home console market segments have merged, which is an assumption that everyone seems to be making. I'm really not sure what evidence there is for them being separate markets, though. Let's go over some factors that seem to be necessary to have two products compete in the same market. Their sales respond to one another. On the most basic measure, this seems to be accurate because Japanese consumers have been replacing their expenditure on home consoles with expenditure on handhelds (rather than expanding both). Secondary market actors treat them as exchangeable alternatives. In previous generations, the handheld market and console market were treated by developers as meaningfully distinct -- each was targeted to serve a different demographic and franchises either took a sidecar approach ("real" games on console with spinoffs on handheld) or an either/or approach (picking which of the two fit their demographic best and sticking with it forever.) This generation we've seen dramatically increased osmosis between the two handheld platforms and the three home consoles, with series that move full-on entries from one to the other (VC, DQ), series that have their "real" entries on handhelds while less important entries are on consoles (MH), etc. There's no thin line nominally separating the two. They are substitutionary goods for one another. It seems pretty straightforward that this is true in a meaningful fashion this generation. Very much unlike the GBA (which had a library of good games but never reached a point of standing effectively on its own), both the DS and PSP have the strength and depth of library to stand alone as full-on replacements of home consoles -- and our sales figures (and anecdotal evidence suggest that there are likely many people who are using them in exactly that fashion. In the West, I think this would be much more arguable (and I'd probably still consider the two as separate markets there.) But in Japan it seems straightforwardly true. Having just two competitors with such distinct yet equivalently strong resources to bring to bear on the fight was really the key, I think. With the PS3/Wii/360 the shifting alliances and fact that someone's usually performing in the middle make it less exciting than the sheer, full-on insanity that follows a major turnover in a straight head-to-head competition. There is the possibility (very good one) Famitsu reports Black/White second week sales from Monday. 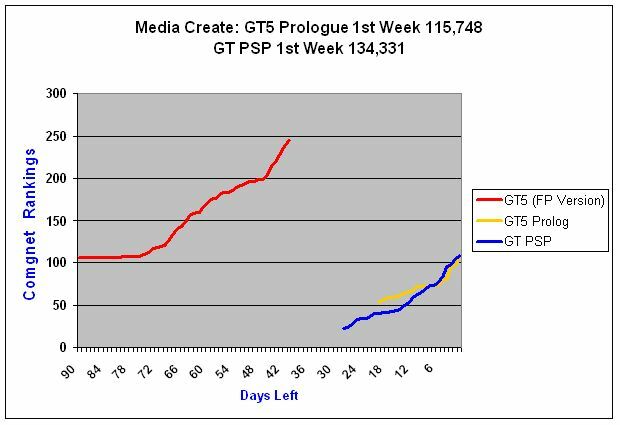 They did it when Dragon Quest IX (after 3 weeks) and NSMBW (after 7 weeks) crossed the 3 million mark. We must have predictions for next week too. Many good sellers. That's interesting. Thanks for pointing it out. I think pretty much everything will end up selling 50-60k next week. Not seeing any huge sellers honestly. K-On is probably the only one which has a really mild chance of getting close to 100k in sales. K-ON is a weird case. The game has more points on comgnet now than Project Diva 2 had at launch. And both games look pretty similar to me, rythm games appealing to the same anime/otaku crowd. There must be some nice preorder bonus or something. Why is the comparison between the PS2's fifth year and the PS3's 3 years and 10 months? Smaller pie and in comparison to the actual market leader. Charlequin, I'll deal with your points a little later with an overwrought analogy that has both landline phones and home phones in it - a market where two different products fulfill much the same need but where the instances of direct substitution are far outweighed by the segment who see them as complementary products. That is, unless I come around to your point of view or if I forget. That would be a very serious mistake to make. Well, I have not been following the anime scene in the last years outside of four of five series but seeing videos on youtube both games look similar to me. It's standard rythm based gameplay and customization. I guess Project Diva appeals to people who likes that Vocaloid thing and K-On to people who liked the anime. The main difference is that Project Diva is very successful because it extends far beyond just being an "otaku" game. It's a legit music game with very strong software features. You can use your own songs (ripped mp3s), and create and edit vocaloid voice + movement routines within the game which then generates itself as play content which can be shared with others. There's a huge amount of user content and sharing going on with the title, as well as DLC adding more official songs a lot Rock Band, etc. Project Diva 2 exploded because the word of mouth and community support for the original title really exploded. K-On is just a licensed game of a pretty popular anime series, in the form of a rhythm game, using songs from the show (it's about a school band). There is virtually zero cross-over with what made Project Diva successful other than "oh, looks animu". It's important to note why Project Diva had such strong word of mouth. It's because it's a complete software suite with tons of user support, and not just a mere game. If Black/White has a second week close to 1 million I'll go crazy and say that it will outsell Super Mario Bros. eventually. Any information for its stock situation? Yep. Thinking about a 6-pack: Okamiden, K-On, Zero no Kiseki, DBZ and both Dead Rising 2. Some thoughts about this...its so suspiciously empty of the traditional throw-everything-you-have day. Its kinda asking for Dec 4th to be 3DS launch. 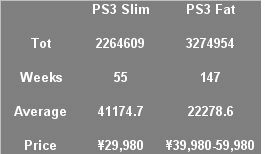 The PS3 resurgence post the Slim and a price drop actually shows that the insane Sony fanboys at the start of the generation may have been right. People in Japan actually were waiting in the wings to jump into the jacuzzi with Sony's new console.. They were right because they weren't insane;going against the PlayStation sisters,the Wii never had a chance to garner meaningful third party support. To make things worse,PS3 had secured key franchises before the generation came to play.Of course,Nintendo didn't have unlimited resources thus Wii saw a sudden collapse in early 2009. What's more, I'm becoming convinced that had Krazy Kaptain Ken Kutaragi not pulled a Spruce Goose on the triple, the PS3 would have won this generation in Japan. Not won it with the same force as its predecessor, obviously but it would have outlasted the Wii thanks to third party support. Industry insiders have no doubt that the PS3 will outlast the Wii by five years thanks to third party support.They've seen this before,they know what to do. In 1996,PlayStation games cost less than $1 million to make. Today, development costs for a typical PS3 or Xbox 360 game run anywhere from $20 million to $25 million.Of course,pricing has not come down as much as third parties would have expected,but software sales are rising,so PS3 is here to stay. Remember: PS3 sales are rising;PS2 sales were declining. At ¥19,980 the PSThree won't be stopped. once you understand how to use it. If Nintendo wants the Wii the last longer they would have already insured that more software would be coming by at least next year. I say this because they would have known support for this year would be lower last year. At least you would think the platform holder would know when games are not coming. If Sony could get software on the PSP Nintendo can get software on the Wii if they wanted to. Nintendo has the money and resources to do it. There are only 3 reasons I can think of that would explain why the Wii would not get more support. One is that they (Nintendo) foolishly think they can carry the console without third parties. The second is that third parties wont support the Wii no matter how much money Nintendo throws at them. The third is Nintendo does not care because they will replace the Wii soon. 18	/ 18	[NDS]	Tomodachi Collection (Nintendo)	- 5,324	/ ? 2) Total software this week: 3.236 million (4.9x last week). Sell-through for Pokemon is around 90% for both versions. More exact numbers for 2 versions. Parmenides there are so many wrongs with your comparisons and predictions that I don't know from where to start. Uh, Parmenides... why do you refer to your Playstations as 'sisters'? Are you... are you doing something with the expansion/HD bays we shouldn't ever know about? When can I buy this mythical unstoppable 19,980yen PS3? I need to know! Paramenides and how does the overall picture look like, without dismissing Sonys and Nintendos software or doesn´t it fit into your agenda? The market covered a big distance (1 million) thanks to Pokemon. At least his pictures this time make more sense than his Dragon Quest one some weeks ago. I still don't know what point he tried to make with it. That he has absolutely no talent with making pictures might be one of the reasons for that. There are only 3 reasons I can think of that would explain why the Wii would not get more support. #1 is that they (Nintendo) foolishly think they can carry the console without third parties. #2 is that 3rd parties wont support the Wii no matter how much money Nintendo throws at them. #3 is Nintendo does not care because they will replace the Wii soon. That's a nice site you have there. Even though Iwata stated many time how important strong 3rd party support is even for nintendo ? why publish games like monster hunter and dragon quest in the west when they dont care or dont think that they need 3rds partys. King Zell normally does this. It's OK. He's a long-time GAF poster and a great and enthusiastic contributor (especially back in the days where scans were still allowed to be posted :lol), and this is content that his site does weekly that you won't find anywhere else on the web. If some random registered for GAF and his first ten posts were plugging his site's copies of images you'd find anywhere in the internet, definitely we'd be down on that. But just like Chris Kohler posting Wired stuff, we're in general okay with veteran members who like contributing to GAF posting links to their site when the site is doing coverage no one else is. I've lurked the Media Create threads for at least as many years as he's been around, yet have never seen link flooding like that before (other than to the usual aggregators). Naturally, I didn't click anything. But if the content is original, useful, and GAF-admin-approved, then perhaps it should be highlighted as such (by means of a tag?) to disassociate him from those who are desperate to bring their freshly-grown blog into public eye, as well as to reassure posters who don't immediately recognise his username. If you read Media Create threads regularly, you'll know that he does this pretty much every week. All the regulars who post in the thread are more than aware of it. Photos of stores selling and promoting the new releases of the week is a regular feature in these threads. Although you make a fair point I don't think I agree. 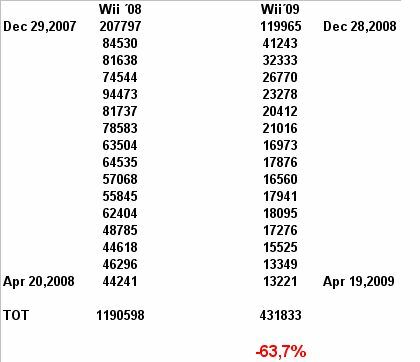 I remember that there was a time where both Wii and DS were doing amazing numbers. Both of them declined but I don't think the decline of the Wii was because of the DS or PSP. I don't think there is anything that points to that actually. It's far more likely to have declined because of poor software support. Also motion controls are not possible on handhelds (like in Wiisports) and Nintendo has been trying to make motion controlled gaming successful. They may have failed in that partially (in Japan) but with all the console makers going into the motion controlled market I think there will definitely be a true distinction between handheld and home consoles. They provide totally different experiences. I'm by no means suggesting it isn't, and it's one of the reasons I (and I'm sure many others) return to these threads. But no, I don't recall ever seeing him link flood, and I stand by my suggestion. After all; newcomers who aren't as familiar with the rules could quite easily see it as an invitation to do the same. We're just lucky the Media Create threads are mostly inhabited by long-time posters, and do not usually see contributions from new users... hence their dwindling popularity. I remember that there was a time where both Wii and DS were doing amazing numbers. Both of them declined but I don't think the decline of the Wii was because of the DS or PSP. I'm not saying any individual decline is directly attributable to sales being directly stolen by a competing system, but rather that across all systems, we see evidence that the same consumer budget is being tapped by all of these systems. Also motion controls are not possible on handhelds (like in Wiisports) and Nintendo has been trying to make motion controlled gaming successful. Irrelevant to the point I'm making. You can make literally the exact same argument about HD to spell out why Wii isn't "really" in the running in the console market and I think everyone would agree that such an argument would be ludicrous. Oh quit complaining Michan, it's not a big deal. Quite a sharp drop for Metroid, but it squeezed out another ~5,000 sales, which isn't too shabby. It wonder if next week is a slow one whether it will climb back up a little. Interesting to see Taiko, Fire Emblem and DQM Wii still hovering at moderate levels as well. 7,000 for Front Mission Evolved for 360, that can't even be making a profit. That would be the case if it's the only version of the game on the market... like Blue Roses. But even then for a game like that it seems to me that the 360 cost of building it along side would be more expensive than the revenues it brought in, that is unless it has some tiny legs. Where the hell is JJS? Haven't seen him post anywhere. That would be the case if this was a multiplatform title intended for Japan only. Which is also clearly not the case. I would really like to know what the sales expections of S-E are for Front Mission Evolved. I think it's a bit more complicated than that. Yakuza 3 showed that it's not impossible to do. Not only did Sega get approval from Sony to do it, but they also charged a discounted price for it. Although that might have more to do with removing content and an incomplete localization, rather than just having subs. 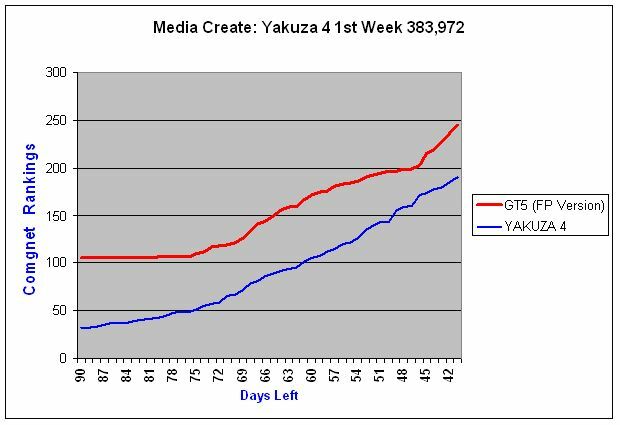 We'll see what Sega does for Yakuza 4, and if any other publishers decide to try that business model out.